These little mouthfuls are perfect to serve with drinks, canapé style. 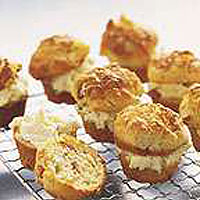 Sandwiching them together with creamy Boursin adds flavour and is a pleasing contrast to the crumbly texture of the muffins. Preheat the oven to 200°C, gas mark 6. Grease two 12 hole mini muffin tins with a little Olivio. Cook the bacon in a non-stick frying pan for 3-4 minutes until golden. Sift the flour and baking powder into a large bowl and stir in the cornmeal, sugar, salt and cooked bacon. Crumble in half of the Boursin. Crack the egg into a separate bowl and whisk in the milk and melted Olivio. Stir the liquid into the dry ingredients, taking care not to over mix. Divide the mixture between the mini muffin tins, scatter with the grated Cheddar and bake for 15 minutes or until well risen and just firm. Allow to cool, cut in half horizontally then sandwich together with the remaining Boursin.